As we know, the 2016 Cadillac CT6 is far from the only vehicle that the 112-year-old brand has up its sleeve. The luxury automaker has earmarked a mighty $12-billion in order to launch a volley of new products in the coming years, including three new crossover SUVs beyond what wee see now and a new sedan. In total, the company has already approved the launch of eight vehicles, five of which will be all-new. While we can piece together how the majority of those vehicles will take shape, some of them are still shrouded in a fog of mystery. Now, Cadillac has pulled the curtain back on yet another of its upcoming vehicles: a two-seat sports car. Speaking with AutoGuide at the 2015 New York International Auto Show, Cadillac President Johan de Nysschen said the brand would “ultimately” add a sports car to the lineup. Just don’t expect it anytime soon. GM Exec VP Mark Reuss also chimed-in on the topic at NYIAS 2015. “The brand’s got to be ready to do something like that. Right now it’s not. I don’t think doing a car like that is going to change the brand image today, either,” Reuss said to us in a group interview. “That would be my last product,” said de Nysschen, indicting the brand is currently focused on other areas, like the CT6. In other words, it’s simply not a priority. This pretty much puts the idea of a mid-engine two-seat supercar currently being developed for Cadillac on ice. While the mustachioed Caddy boss didn’t provide much else on the topic, he did say that a large RWD coupe like the Elmiraj concept is not in the cards. Which makes us sad. Despite the extended time frame, this it still promising news. After all, de Nysschen is also the guy that helped launch the Audi R8. And that car arguably helped tip Audi into the success it’s enjoying today. Though the details remain unclear, one thing is for certain: The 640hp CTS-V is clear proof that a well-heeled Cadillac certainly isn’t unavailable. it seems to me that if the CT6 had been the production version of the Elmiraj then we all would be praising Cadillac and waiting anxiously to test drive it and buy it. But the fact that the CT6 looks like a larger CTS is the reason why it’s generated a big yawn from most enthusiasts. Well, I guess we can all still just look at the pics of the Elmiraj and dream. And lust. First you need to understand the CT6 was locked in before the first line of the Elmiraj was penned. This is one of the cars that help convince Cadillac could and should do better and what got them the $12 Billion to jumble things up even more as even as good as the CT6 is the new leadership expects to have even better product. While the Elmirage would have bee good looking it still would not have been enough to make Cadillac what all they want and need. In this segment it is much more than just making a car look good it has to be the best in all parts of the segment. They are still looking at the Elmirage but the one hold up is they had no platform to put the car on that could be done on that wheelbase. It was a show car on a non production platform. I would expect one of the first new car in 2020 will be something similar but updated. It is still an indicator of the direction the styling is going. The last car that should be done is a sports car. The sports car is not so much a profit center as it is a promotion or marketing center. You have to have product available to market before you make this one. At this point each car in the lineup will be completely replaced with even better product including the CTS and ATS. Even the coming SRX will be effected at some point too. I think many do not realize how much is going to change now under the new more independent leadership. Their own models and their own engines will become a common thing here along with technology and quality Cadillac was never expected to see again under full GM control. I just went to the New York International Auto Show. I saw the CT6 IN PERSON and it does NOT look like a stretched CTS. It uses Cadillac’s art and science design tastefully and elegantly! It’s technology is impressive as well. It’s hard to believe a car this size weighs as little as it does. I look forward to its future test results! I understand if Cadillac doesn’t plan on building the Elmiraj itself, but a true luxury lineup isn’t complete without a full sized grand tourer. All the present models at Cadillac will get replaced with the new money. What we have today is just the next 5 years and much of it will then begin to be replaced. I do expect some form of a sports car after this happen. The car may or may not be a C8. Also there could be more than one two seater in time. BMW and Benz have offered variation of low volume sport cars and one is always a roadster. There is a full size car coming that will be over the CT6 but the work has just started. GM woke up and understood they had a good car but needed a great car for this slot. We will get it. I know about the full size sedan, but as far as the CT7/CT8 is concerned, one of those MUST be a coupe. Cadillac can’t sleep on the S Class coupe. Caddy’s heritage lies in it’s big coupes just as much as their big sedans. Matter of fact, Mercedes-Benz is who Cadillac should be benchmarking when it comes to product portfolio. They have to have the most comprehensive lineup in the luxury world, unlike BMW who blows development money on niche vehicles while leaving noticeable product gaps. But before they will make what they should do, large luxury cars, renovate to improve styles and CUE ATS / CTS / Escalade and 3 new crossovers. 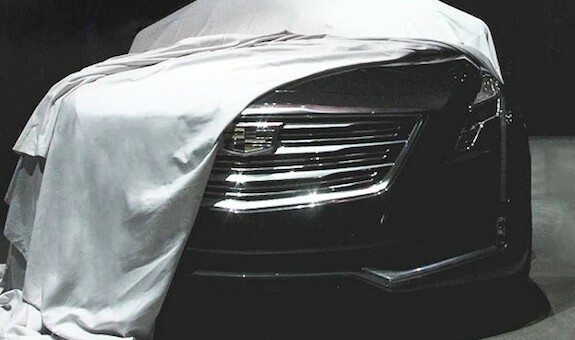 the CT6 looks nice….I think the CT8 could have an all-new disghn them…..CT6…2016 CT8….2020.